The main living area of our clients’ 1990s home was divided by walls into segmented rooms for the kitchen, dining room and family room. This resulted in confined spaces that interrupted traffic flow when hosting get-togethers. 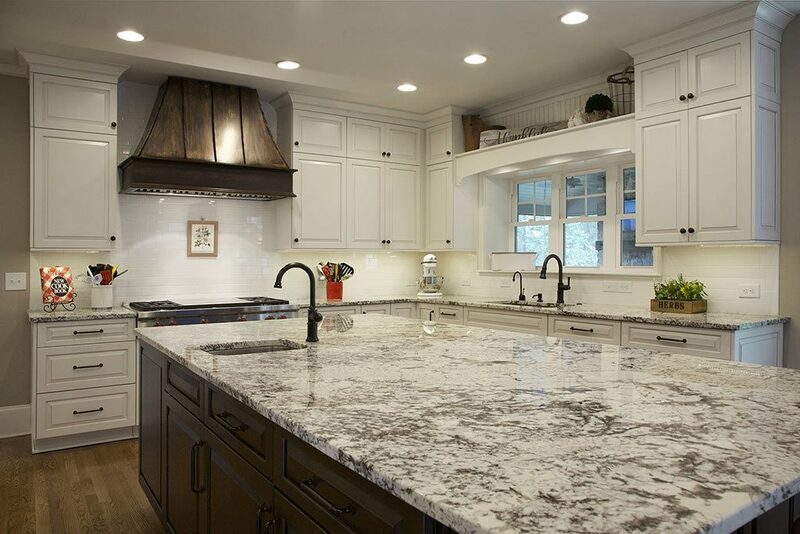 Our clients came to Atlanta Design & Build expressing the desire for an open kitchen remodel that would enhance their entertainment of family and friends. 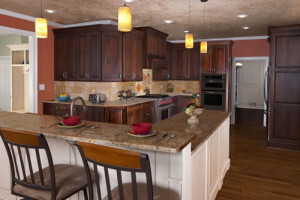 They wanted their kitchen to be brighter and more welcoming. 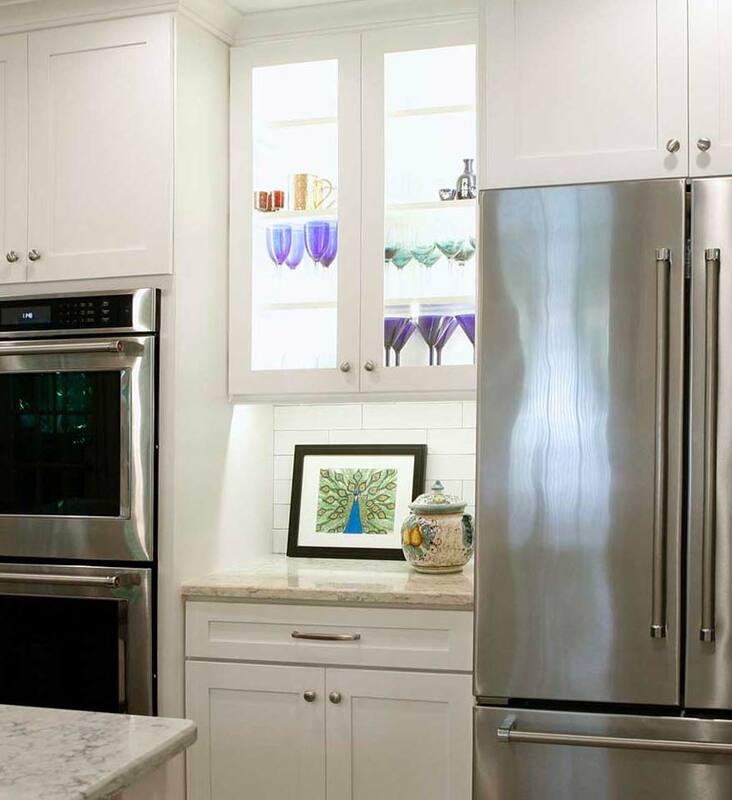 They also felt the need for increased storage, including the creation of a large “to-die-for” walk-in pantry in the space taken by the laundry room, which they wanted to relocate upstairs. 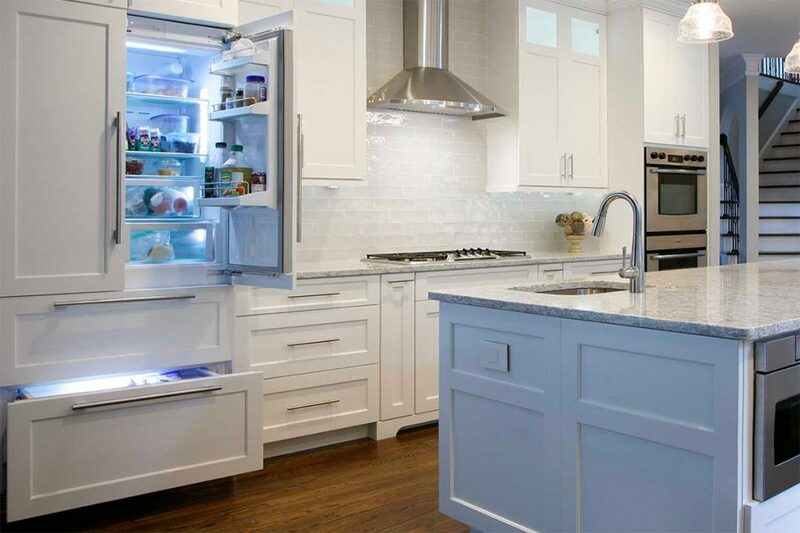 The ADB team designed a new open floor plan that perfectly met our clients’ needs and desires for their kitchen, and it impacted their other living spaces as well. The plan involved the removal of a primary load-bearing wall expanding from the front exterior wall to the back exterior wall of the home. Both an 18-foot steel beam and a 10-foot LVL beam were placed into the ceiling to support the load. Also removing the wall separating the kitchen and dining room, created the free-flowing expansive openness desired. See the before and after floor plans here. The 1960’s split-level home for this family of four was in desperate need of a whole house remodel. Our client desired an updated kitchen, new entry way, a screened porch and an open floorplan concept for their family room with a higher vaulted ceiling. They needed us to raise the roof to accommodate their dreams for the home which is JUST what we did…LITERALLY!! These are images not many people get to see outside of the ADB team and the family whose home we are working on. Join us on this unique behind-the-scenes look at what makes us Atlanta Design & Build. Enjoy this time-lapse video of our team removing the existing roof as preparation for construction of the whole house remodel. Follow this story to see the beginning stages of the interior, our ADB team hard at work, in-progress photos, and the final product. Watch all of the progress videos here. At Atlanta Design & Build we know it is very important to protect the health of your family and pets during a remodeling project. We make it our top priority to maintain a clean and safe job site while your project is ongoing. One of the more serious hazards is the airborne dust that is stirred up by our work. This dust could migrate throughout your home and pose a problem to your health. We know the value and how important it is to contain and eliminate all types of worksite dust, which includes dirt, debris, organic matter, drywall, cement, silica and sawdust. Not only that, we are dedicated to protecting your personal belongings from the dust as reasonably possible. To that end, Atlanta Design & Build has developed an extensive dust control plan and best practices, investing in the newest dust control technology. 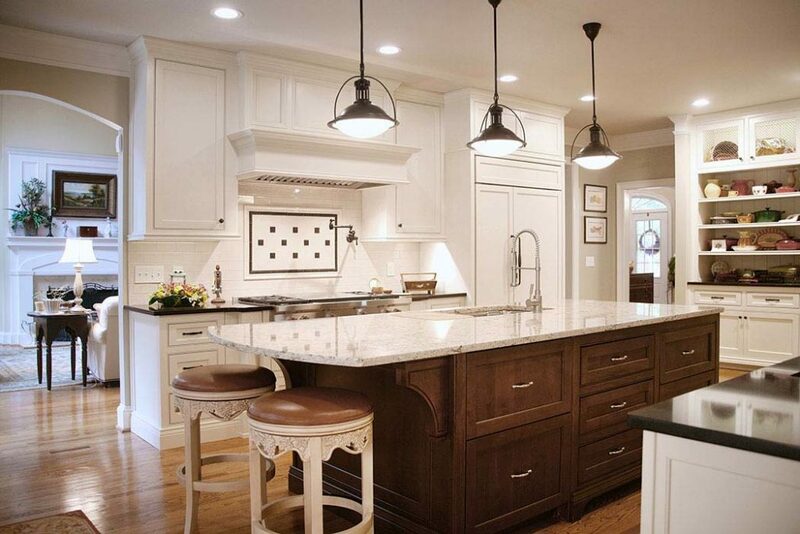 A Kitchen island can help promote togetherness, especially when they are designed with seating. While some prepare the meal, the others can sit close by and keep them company. 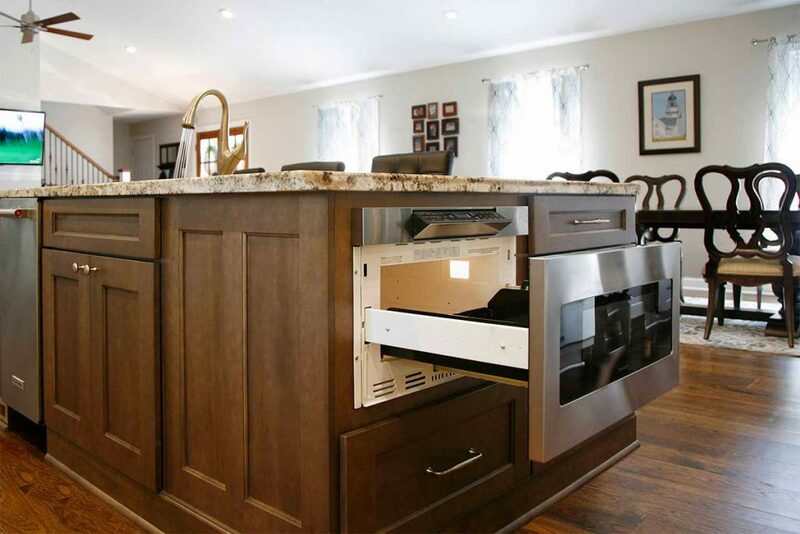 This avoids the isolation that homeowners often complain about when kitchens are walled off from the living room. With an open kitchen, there is no more being secluded from your family or guests.